Getting executives on board with design thinking can be an exercise in patience. Think of it as teaching a class. How would you explain to a classroom full of five year olds what design thinking is and how it can help them get more chocolate? More importantly, why this method over something else? For starters, we like using this Venn Diagram to explain how Design Thinking fits into the larger picture of innovation in an organizations. It’s vital for management to see that you’re thinking bigger picture. 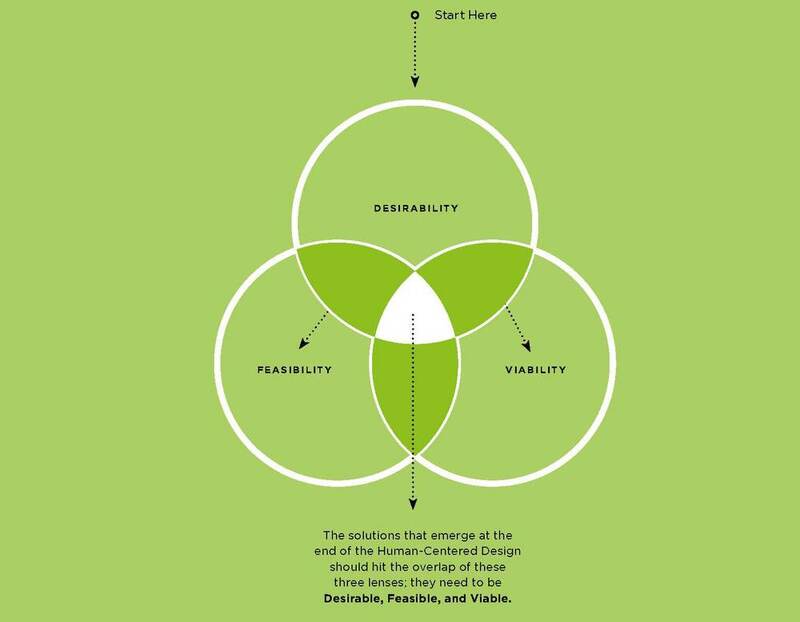 As you narrow down to details, it’s helpful to break down the mystic barrier of Design Thinking into practical steps. There is no shortage of beautiful visuals out for you to use (here's an example). The process has its variations, but the general framework is fairly constant. That takes care of the what & how. The lynchpin is the why. Why do they need to pay attention to this method over their current mode of problem solving? In other words, what’s the benefit? application beyond R&D; any team can use this process to solve business (and even life) challenges and/or as team-building sessions. Design Thinking and co-creation isn’t a fad, but rather a new way for all problem solvers to put the user at the center of a problem to develop solutions from the outside in rather than the inside out. We’ve also found it helpful to keep a regular schedule of updates flowing up the ladder for continuous buy-in. Updating executives on progress, letting them listen or view recorded user sessions is one of the most effective ways to get support. If you’ve ever tried explaining design thinking to executives, you’ve probably heard some version of this. Drawing abilities aside, in some ways “design thinking” is a misnomer. Although the method was born in the design world, it has long ago ceased to be the “designers” domain. And, while a lot of the tools embedded in the design thinking process come from the design world, the process itself is fundamentally a way to develop products and services in a customer-centric way. Yet, Here’s what usually happens today: an executive says, “wouldn’t be interesting if……?” His direct reports rummage through reams of data in expensive industry reports, or some such quantitative data source. They come back with a nice powerpoint presentation about why the idea will work (or not). Decisions get made. Where’s the customer in all this? The outcome of applying design thinking has been proven through different case studies from various company sizes and industries such as Apple, Microsoft, IBM, IKEA, AirBnB, Starbucks, and others. Design thinking supplements existing quantitative methods with a qualitative approach of focused on identifying customer needs. Design thinking practitioners use data from customer conversations & observations to create validated products & services that fulfill today’s needs, anticipate future needs, and delight every day. No expensive industry reports required.